In 1845-and the decades that followed-a billiard table was a fine status symbol. The mere presence of a table stated that you were a person of wealth and influence - because you could afford a table, you could afford a home large enough to accommodate one! But a man of influence and position had more than one reason to own a billiard table. Billiard tables were also constructed from expensive materials at the time. Aside from the pure enjoyment of the game - and impressing guests - a man could complete negotiations over a friendly game of billiards. Whether commercial, political, or even military, serious issues could be discussed, and deals could be struck, over the neutral ground of a billiard table. One of the first real American celebrities who owned a pool table was an immensely important person in American history - Abraham Lincoln. Lincoln was a self-confessed "billiards addict." He described the game as a "health inspiring, scientific game, lending recreation to the otherwise fatigued mind." It is quite possible that critical issues of national interest - slavery, international relations and the civil war - were handled over the slate of a great billiard table. We know of one account in the 1890s, when Buffalo Bill Cody, Texas Jack Uhumbro and Wild Bill Hickock were touring with their "Wild West" show. While drinking in a tavern in Boston, a group of about thirty longshoremen decided to see how tough these "Westerners" really were. Well, Hickock grabbed a pool cue, and about one minute later, there were four people left in that room-Hickock, Cody, Texas Jack, and of course, the bartender. Buffalo Bill bought a billiard table shortly thereafter. The foremost captains of industry - Andrew Carnegie, John D. Rockefeller, William Vanderbilt, Henry Ford, J.P. Morgan and William Randolph Hearst - all of these people owned billiard tables. And we can only speculate what issues were discussed, what negotiations were undertaken, and what matters were handled over a game of billiards. Teddy Roosevelt, our Secretary of the Navy and the hero of San Juan Hill, the President of the United States and, later, a distinguished wild game hunter, owned a billiard table. How many of the decisions that shaped our world where reached over a pool table? 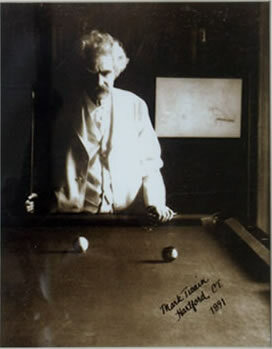 Among sports figures and celebrities, Mark Twain, one of our nation's most renowned authors, Babe Ruth, one of our great sports legends, and Humphrey Bogart, one of our greatest actors - all owned billiard tables. Nat King Cole, Lou Gehrig, James Dean, and of course, Frank Sinatra also owned billiard tables. There was a billiard table in the White House during the administrations of several recent presidents. And when President Eisenhower established Camp David, it was furnished with not one, but four billiard tables. Every President from Eisenhower, including Kennedy, Nixon, Carter, and Clinton, has used those tables. A stream of notable visitors, including Winston Churchill, Nikita Krushchev, Charles de Gaulle, Anwar Sadat and King Hussein, all knew those tables. Margaret Thatcher and Ronald Reagan were known to be pretty good players. What issues of world security, what areas of common ground, what conflicts were settled over those billiard tables?